People trekked, rode bicycles and drove tractors to polling stations in the world’s biggest democratic exercise, with nearly 900 million eligible to vote during seven phases of balloting spread over 39 days, and vote-counting set for 23 May. “I’ve never missed my vote in my life,” said Anima Saikia, a 61-year-old woman in Assam, who was among early voters in the first phase. 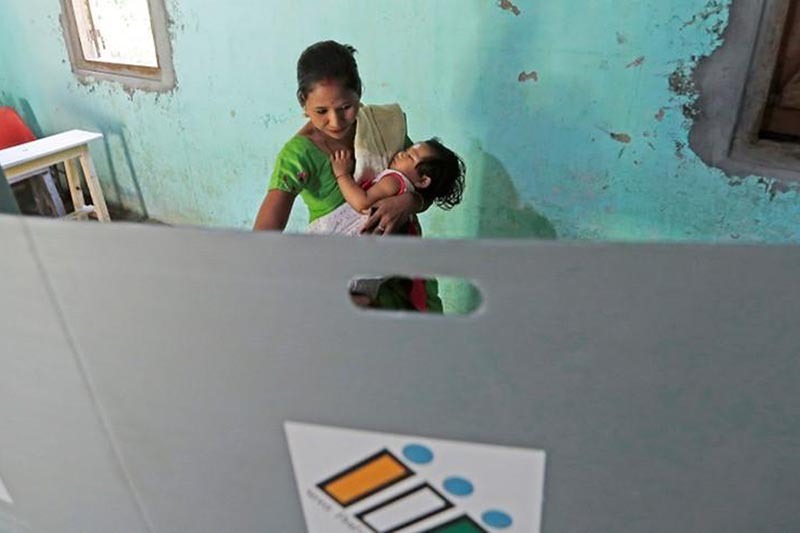 Boosted by a surge in nationalist fervour after hostilities with Pakistan in February, Modi’s Hindu nationalist Bharatiya Janata Party (BJP) held the advantage going into the election, opinion polls showed. “He’s improved India’s global standing, and taken revenge against our enemies,” Sachin Tyagi, 38, the owner of a mobile telephone shop, told Reuters near a polling station in Uttar Pradesh, India’s most populous state. By 3 pm, with three hours to the close of polling, more than half of voters had turned out in most states, the Election Commission said. Voter participation was the highest, at 70 percent, in the eastern state of West Bengal, where the BJP is on a collision course with a firebrand regional politician. While tension with Pakistan has fuelled nationalist sentiment, political analysts say the BJP has soft-pedalled its agenda to spread Hindu culture in a country where a fifth of the population of about 1.3 billion belongs to other religions. The main opposition Congress is leading the fight against the BJP, partnering with smaller parties in some places and elsewhere going it alone, hoping to bank on the charisma of its president, Rahul Gandhi, drawn from the Nehru-Gandhi family. In a letter, Congress told the home ministry a green laser had been pointed at Rahul Gandhi’s head intermittently during the meeting, making a total of seven instances. Feedback from former security personnel suggested the laser could have come from a potential weapon, such as a sniper gun, the party added. The home ministry dismissed the fears, saying the “green light” was found to be a mobile phone used by a Congress photographer. In the southern state of Andhra Pradesh, a scuffle between supporters of two regional parties turned violent, killing at least one person and injuring four, Reuters’ Indian partner ANI said. As voting began, Modi said the mood was firmly in favour of his National Democratic Alliance (NDA), whose senior party is the BJP. “NDA’s aim is – development, more development and all-round development,” he said on Twitter. It has sought allies among regional parties to defeat the BJP over its economic record, but pollsters say support for the ruling party grew over Modi’s tough stance against Pakistan. Copyright © 2019 Reuters Published in Reuters website Posted in News.